Get 15 Tables Worth of 120” Poly/Visa Tablecloths (in any Color) $300 value from Quality Rental. 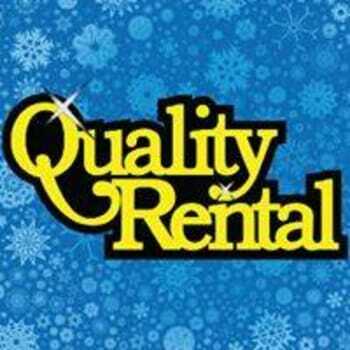 Welcome to Quality Rental! We are a full service rental superstore that specializes in tent rentals, weddings, party rentals, graduations, and special occasion events. We understand the importance of your events and have been developing the systems since 1969 to get consistently positive and memorable results. We have capabilities to plan and execute very large scale events, yet still hold onto that small business vibe with direct personal relationships. Renting allows people to use extravagant, over the top, fun, and generally useful items for short periods without making the huge investment of purchasing. We have all of the staple items everyone wants like tents, tables, chairs, linens, and catering equipment. Fun rentals like inflatables, carnival styles games, dunk tanks, lighting, audio equipment, photo booths, and decorations. We also have a successful equipment rental division that assists with contractor and homeowner rentals as well as small engine repair. Visit our showroom, talk with us on live chat, or give us a call! All winners will be sent confirmation e-mails after the close of the auction. Items may be paid for using payment link in confirmation e-mail or simply log on to the auction site, click on the item(s) won and submit payment. Items will be available for pick up starting Wednesday, March 27th at 9am. Neither iHeartMedia or the participating auction business you purchased are responsible for lost vouchers/vouchers.